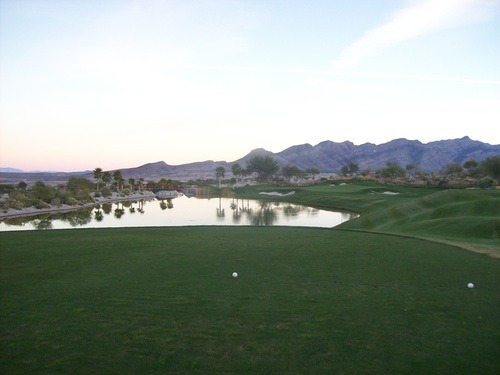 This weekend, I spent both days out in the Las Vegas area, enjoying plenty of good golf, gambling and a severe lack of sleep. 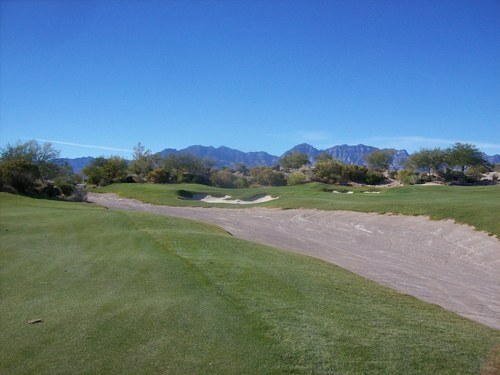 In the process, I played two Jack Nickaus-designed courses. That’s fitting because I’ve been on an unintentional Golden Bear kick lately with a number of recent rounds at SoCal Nicklaus tracks. I’ve always been curious about this course, but never quite had the opportunity or excuse to travel all the way out there. 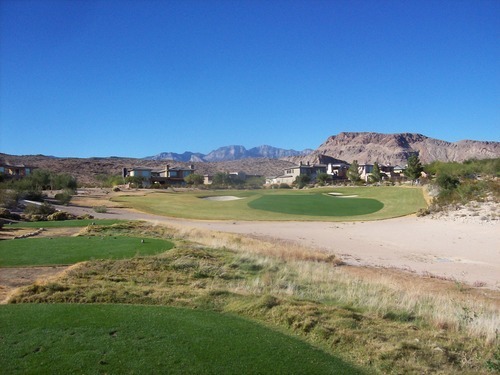 After all, the remote location is one of the biggest stories at Coyote Springs. 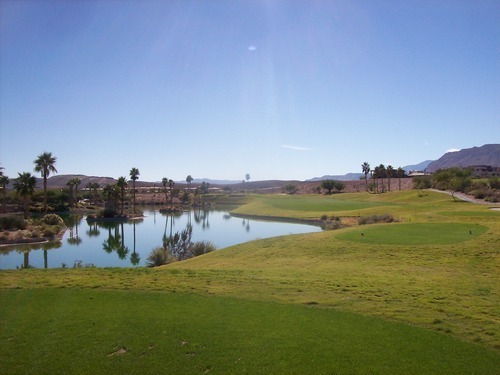 Coyote Springs is situated about an hour northeast of the Vegas Strip and west of Mesquite. 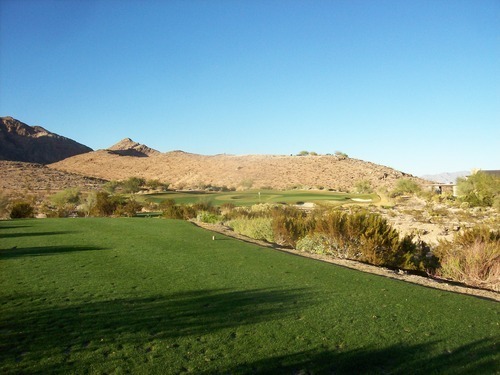 It’s kind of equidistant between the two golf towns, but not quite right in between as you have to venture a little ways off of the I-15 to get to it—where the desert highways 93 and 168 meet. 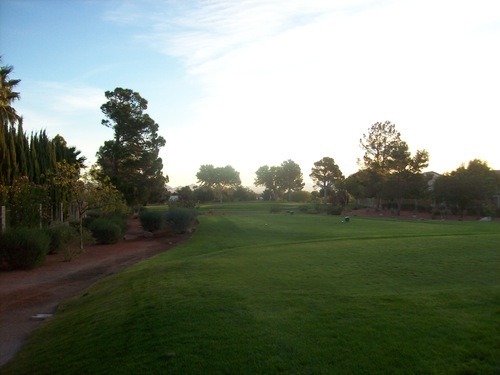 The golf course is part of what was originally supposed to be a premier residential community with multiple championship courses. I don’t know all the details, but it was conceived during the golf boom and fizzled out with the downturn in the economy. I presume the course was built as a lure to bring people out and show the potential of the property. 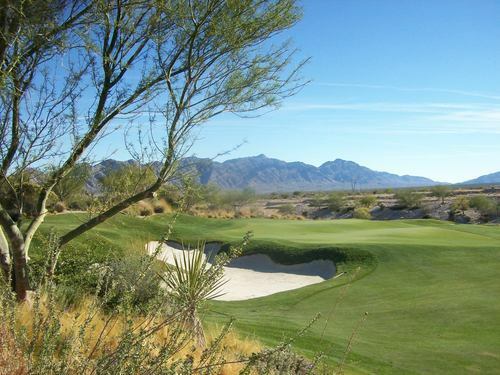 They hired Jack Nicklaus and his team to craft something with a lot of appeal. In talking with the people that work there, it seems at least some of the development is still a hope someday as all the land appears graded for housing and potentially more courses. 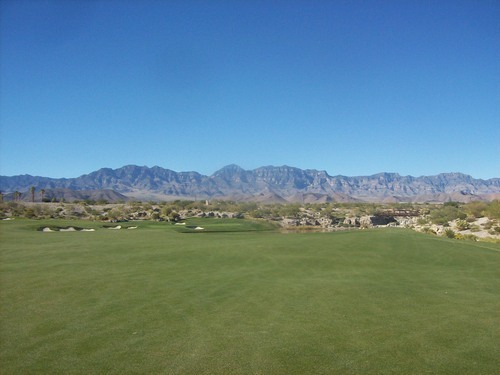 But for now, it’s just a golf course—and literally nothing else—for miles in any direction. It’s a rather unique situation. 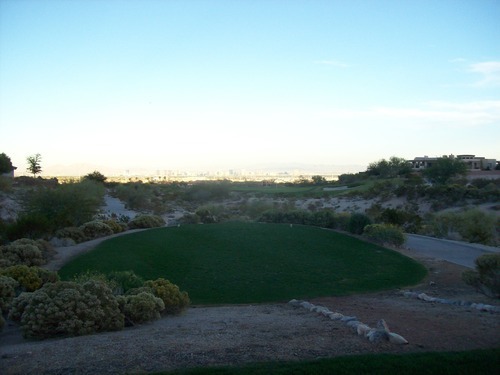 With that kind of back story, it’s amazing the course has even survived all these years because it is so far out of the way. Also, people living or staying in Vegas or Mesquite/St. 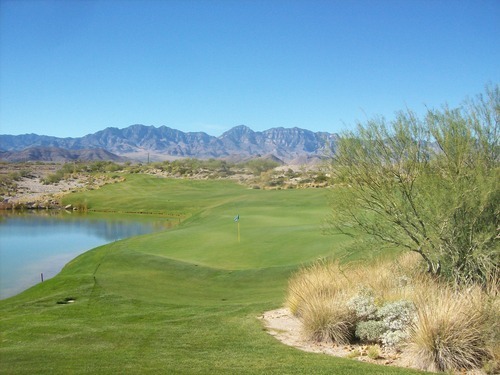 George have no shortage of top-shelf courses to choose from, so it can’t be easy to draw visitors when there’s literally nothing else around. Well, it has survived and seems to be doing alright. I’m sure glad I finally got a chance to play it Saturday. 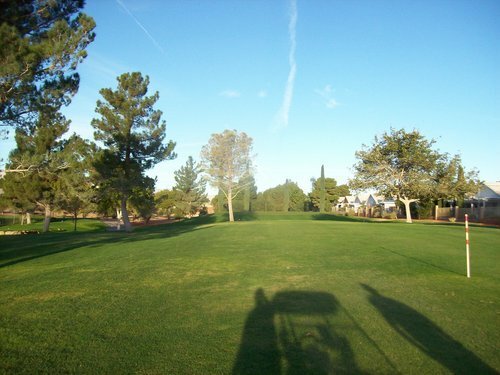 We booked an 11:40 time through TeeOff.com with a 30% promo code. When all was said and done, it ended up being around $55 each, which is a great deal here this time of year. It was a long drive up in the morning, but we made it and were pleasantly surprised by how mellow it seemed in the parking lot and small pro shop. They seemed pretty casual as we made our way out to the practice area and first tee, which are a very long cart drive from the parking lot. 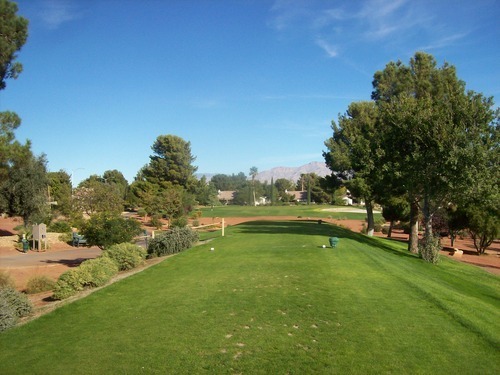 In fact, there are some routing issues throughout the course, but it’s only a minor inconvenience. We rolled a few practice putts and then worked our way to the first tee with no sense of urgency. The starter did say they had been busy that day, but it sure seemed calm when we teed off. We thought we might have a pretty smooth and quick round until we ran into the groups ahead on the 2nd hole. After that, play was brutally slow and we barely finished before it was too dark. The total pace of 5 hours, 15 minutes was downright awful and there was no marshal out there trying to push things along. In this aspect, I think the course was way too “casual” about things on a busy weekend. 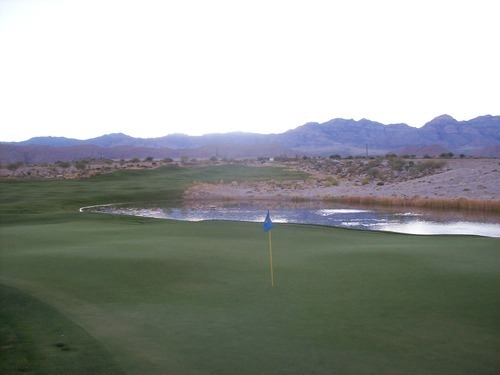 Beyond the poor pace of play and lax management, there was nothing else to complain about with Coyote Springs. 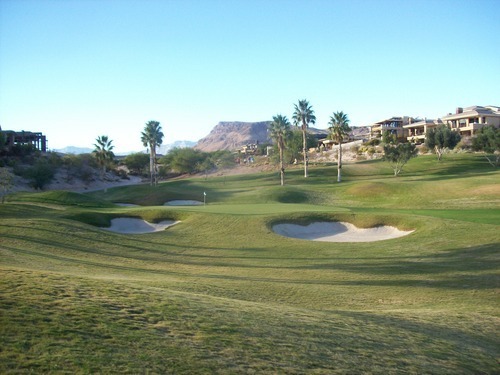 This is a really nice course in a beautiful secluded setting that features a very challenging and interesting design from 1-18. 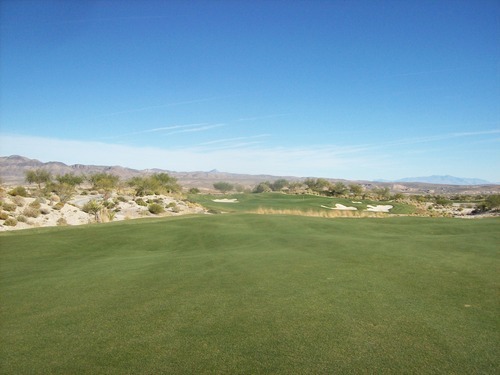 Each hole offers a different design and strategy. There are a few shorter holes for risk/reward decisions and others that are just lengthy brutes. 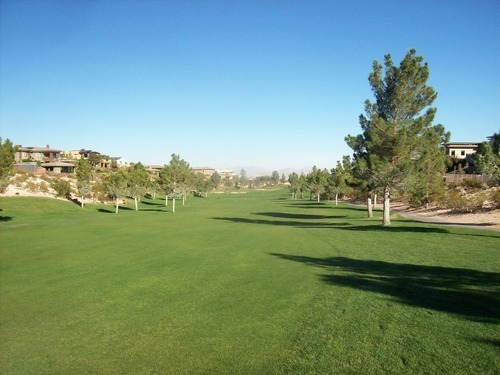 The fairways feature plenty of undulation, but it’s the rough here that will test your game—and your patience. It is deep, thick and covers all sorts of nasty mounds and shelves. 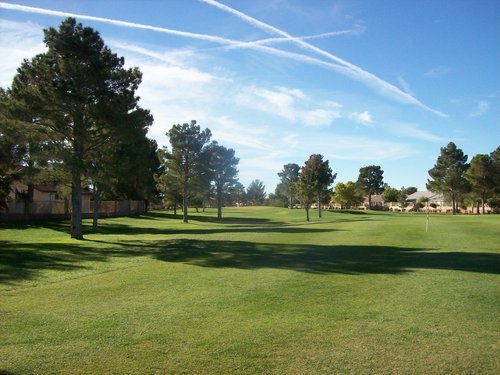 If you miss a fairway here, you’ll likely be left with a tough lie and an awkward stance. 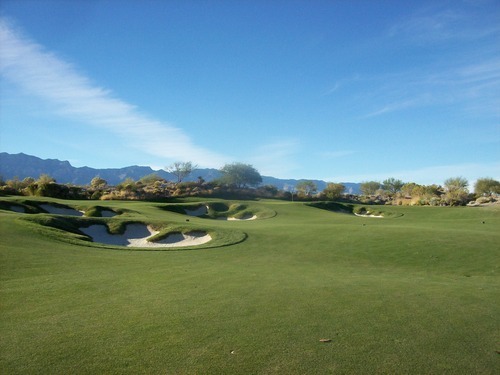 If you miss a green, particularly near one of the elaborate and deep bunkers, you will be hating life. 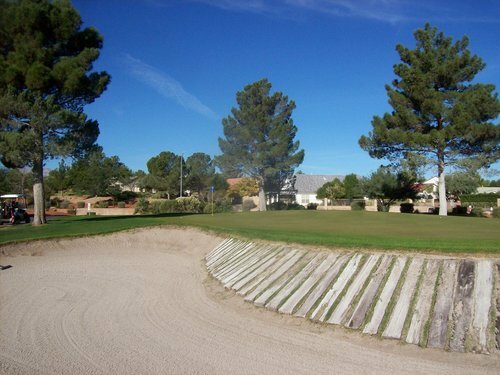 In fact, you will be praying your ball finds the bottom of the bunker rather than the rough around it. There are plenty of great-looking water hazards in play and some water features (waterfalls, bridges, etc.) to enhance things aesthetically. 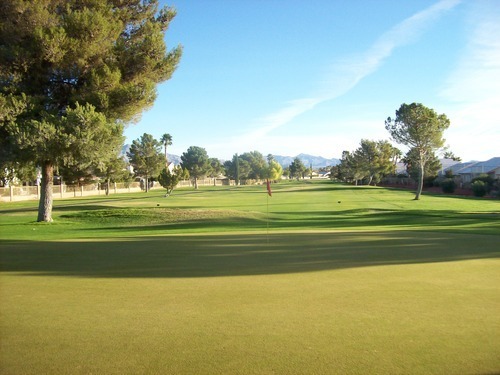 It is designed to be a “pretty” showcase course for this proposed community and it serves that purpose well without completely overdoing it and detracting from the excellent golf course itself. 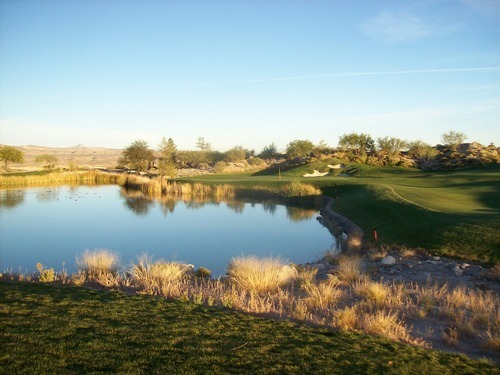 There are many memorable holes at Coyote Springs, but naturally people won’t forget the side-by-side 9th and 18th holes on either side of a big pond with those aforementioned waterfalls between the two tees. We really didn’t get to fully appreciate the 18th as we were playing with very little daylight left, but both are great finishers for each nine. One worry we did have coming in was conditions. 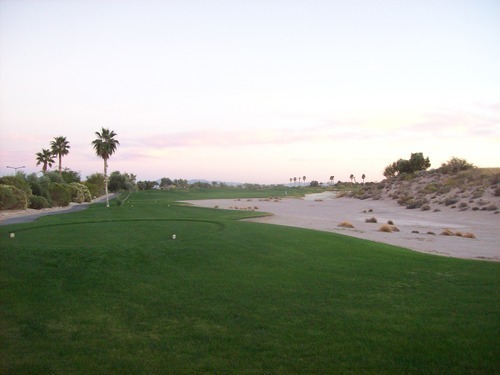 Even when they say it’s in nice shape, it’s hard to know what to expect for a course that is so remote and has been know to have its share of financial struggles over the years. 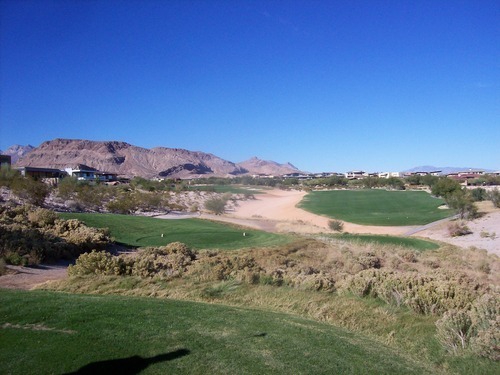 When they say things are “great,” are they speaking in relative terms to Coyote Springs or in relation to the high standards of most Vegas/Mesquite/St. George courses? Thankfully, it was in excellent shape by any standards. 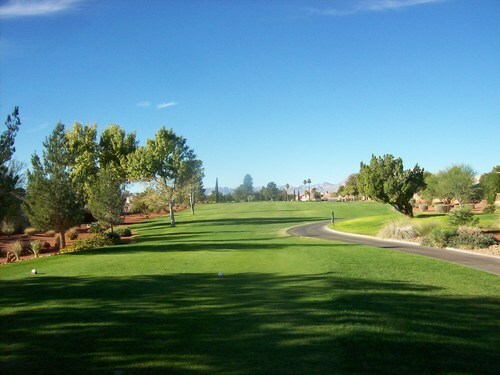 It was super lush and green throughout tee boxes, fairways and rough. 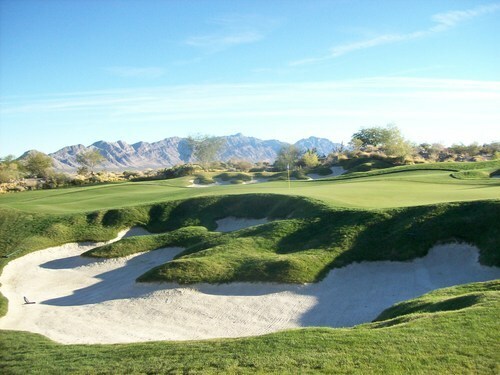 The sand in the bunkers was good and the greens were also great. They did get fairly bumpy late in the day with all the spike marks, but the turf was in very good shape. 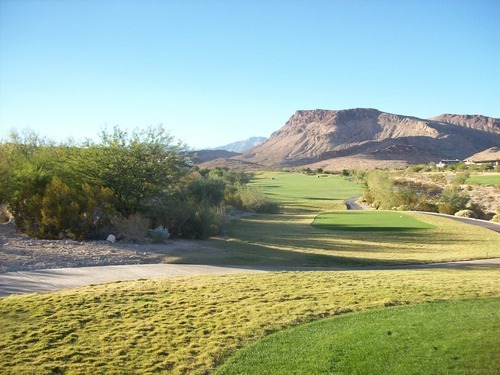 Aside from the slow pace of play (which may have been an anomaly the day we played), I wouldn’t hesitate to recommend checking out Coyote Springs to any golfer. 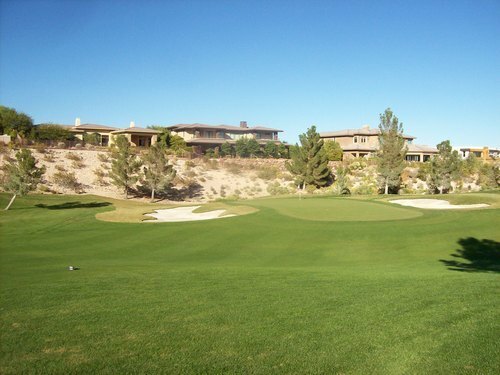 It’s definitely out of the way, but I’d rank it above most other Vegas area courses I’ve played. 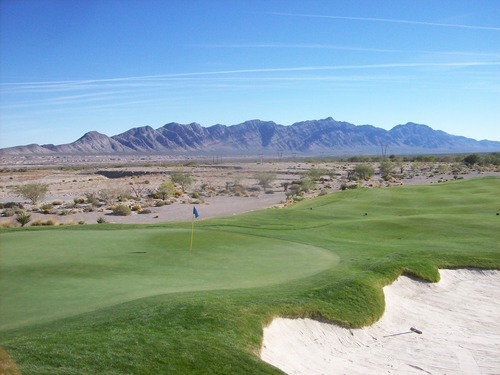 It does have some similarities to Paiute with its remote location and unobstructed views, so if you like the vibe there you will also enjoy the setting at Coyote Springs. 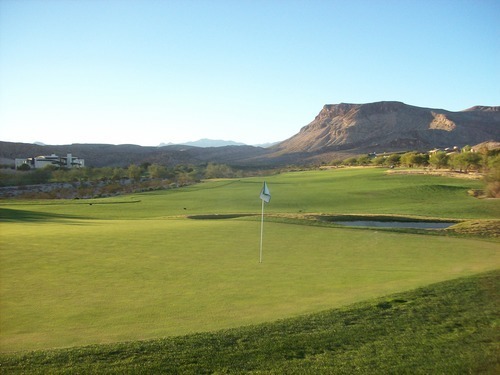 Ironically, the lack of civilization is one of the coolest aspects of playing at Coyote Springs. Sadly, if this place was all developed out with houses and other community buildings around the course(s), it would lose some appeal for me personally. It’s kind of a catch 22, I guess. What made it hardest to get up and out to this course so early was that it was not the “marquee” round for the weekend. Really, it came about as there weren’t many other early Sunday morning times that really appealed to us and Los Prados had a good deal available through Groupon. 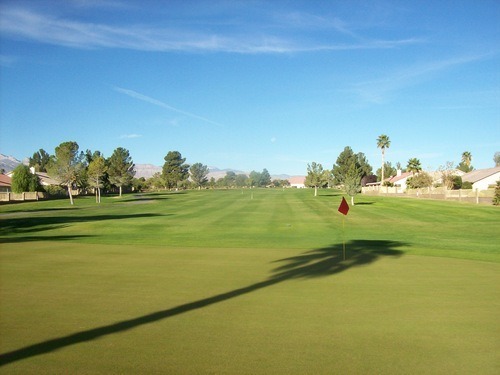 $55 for two players including cart and a free drink (beer or soda). It was fairly chilly when we teed off around 6:30, but that helped wake me up and I felt surprisingly good throughout the whole day afterward. I was completely beat when I got home around 11:00 Sunday night, but that’s a different story! Anyway, we were the first off in the morning and enjoyed our own pace. 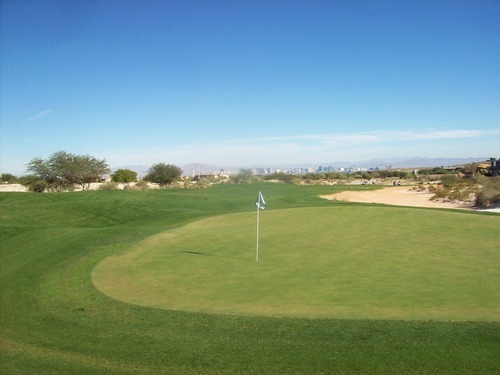 The staff here was very friendly in getting us going, as well as after the round. 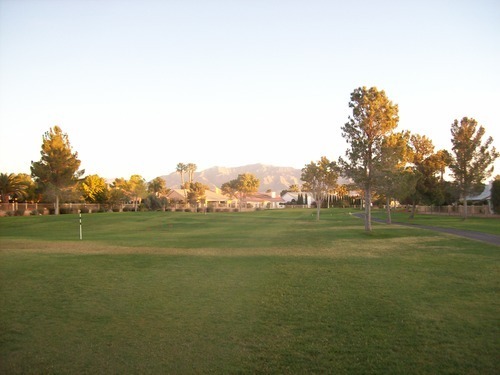 Los Prados is within a senior-oriented community, so most of the play is from members and locals. 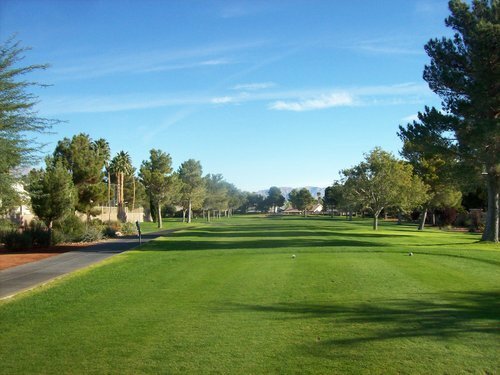 Unlike most Vegas courses that cater to the out-of-town visitors, this one is what it is and the regulars clearly enjoy it. By the time we finished, there were many people out there ready to tee it up. 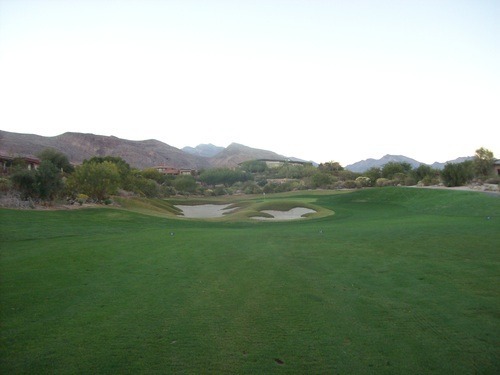 Most of the layout is pretty straightforward outside of a few quirky holes like the par-4 6th with a severe dogleg right and a somewhat “hidden” green complex. On this hole, it was hard to tell what’s going on with the hole from the tee box and the GPS on the cart didn’t provide enough detail to help. 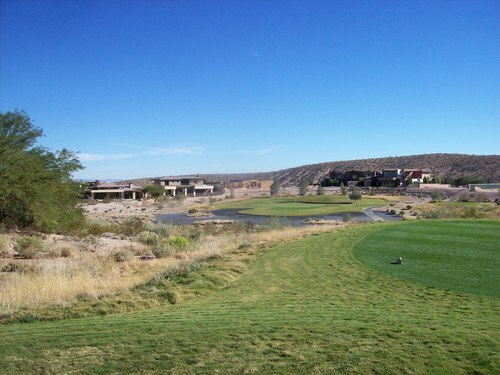 Otherwise, Los Prados is very short at just 5,363 yards from the back blue tees and playing to a par of 70 with three par-5s and five par-3s. For us, it provided a decent warm-up for our afternoon round. More importantly, it was a chance to kind of let loose and have some fun. 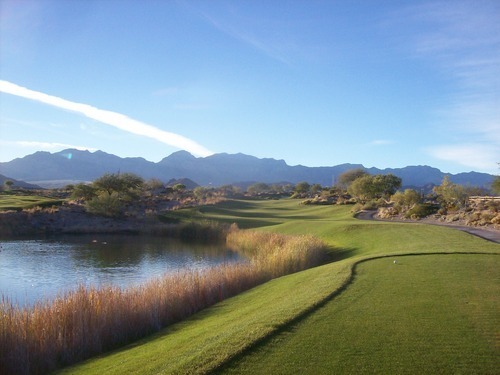 There are a few tight tee shots, but mostly the course is pretty forgiving and straightforward. 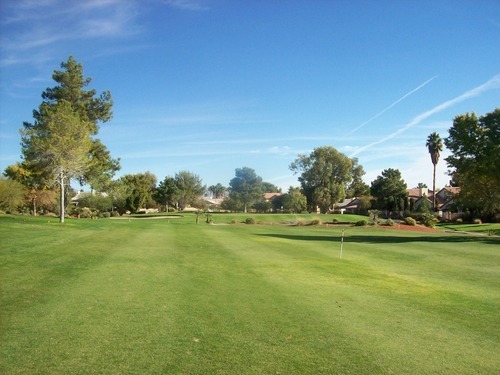 Longer hitters can fire away at the greens and you can play as aggressive as you want throughout most of the course. 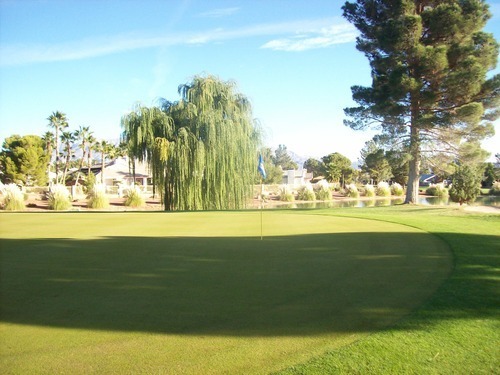 The greens are pretty flat and basic, as well, so a low score should be posted. In fact, it is rated so low (64.8/103 from the blues) that you better post a low score or your index will take a hit. I shot a 79, and I’d normally be stoked about any round in the 70s, but here that was a 14.2 differential! 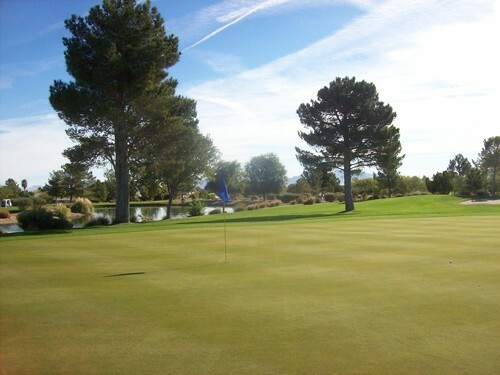 The course was in good condition overall. There’s not really a “pristine” contoured look here, but the playability was good. The tee boxes were a bit chewed up in places and the fairways were a bit shaggy at times, especially when wet early in the morning. The rough was spotty in some places, but mostly good. The greens were quite firm and rolling smooth at medium/slow-ish speeds. I don’t remember being in a bunker, so no comments there. 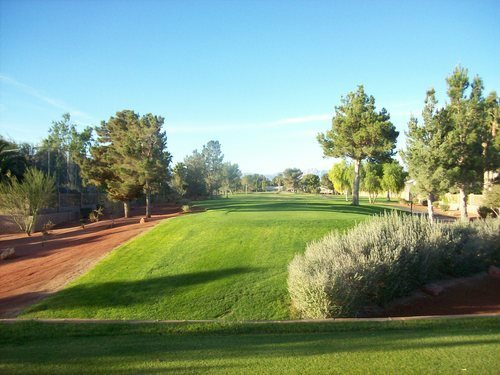 This is a fine little course that’s a good fit for the senior crowd it mainly attracts. For out-of-towners, I wouldn’t recommend it as there isn’t really anything too distinctive about the layout or setting. 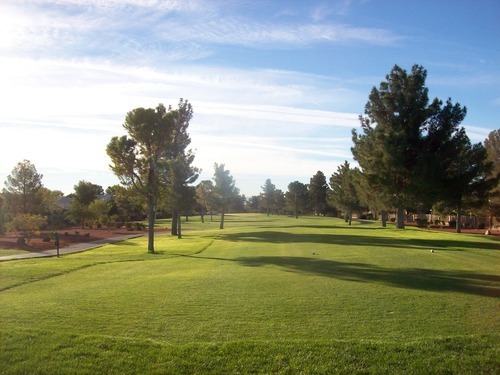 For locals, though, it’s a decent option for an inexpensive, fun round—especially this time of year when other Vegas courses are charging some hefty rates. 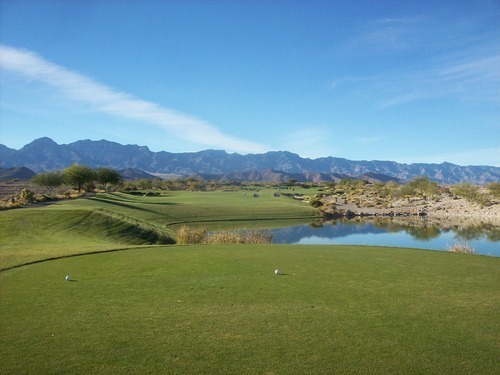 We had booked a 12:20 tee time, also through TeeOff.com with a promo code, so it worked out to around $54 a player. That’s a really good deal this time of year when the weekend morning rack rate listed on their website is a ridiculous $249 and other people checking in ahead of us at the pro shop were paying $135 for an afternoon round. We got there quite early to check in and hopefully get out a little early. 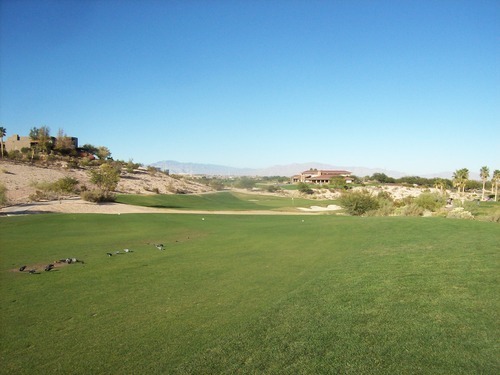 After our really slow round at Coyote Springs, we were feeling quite apprehensive about a later start on an even more popular course closer to town. Unfortunately, the tee sheet was full and we were stuck with the time we had booked. Fortunately, though, Bear’s Best runs a much tighter ship as everyone teed off on time and the starter kept the tee sheet on schedule. The pace on course started off pretty well the first few holes, but then really slowed down for awhile and again we were worried about finishing before dark. However, the back nine pace picked up a little more as everyone started to play with more urgency. Thankfully, we were just barely able to finish before it was too dark to see. 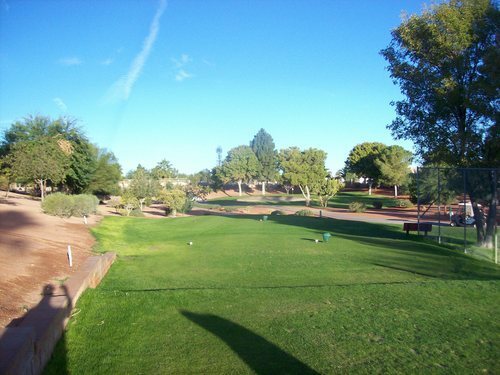 The only bummer about this is that we didn’t really get to appreciate the 18th hole very much. Normally, that might not be a huge deal, but at Bear’s Best it’s more significant. 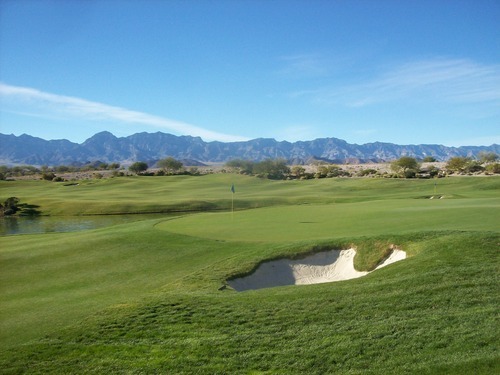 In case you aren’t familiar with Bear’s Best, it is a compilation of “replica” holes from Jack Nicklaus-designed courses throughout the Western U.S. and Mexico. There’s another Bear’s Best in Atlanta that features different holes from more Eastern U.S. and United Kingdom courses. 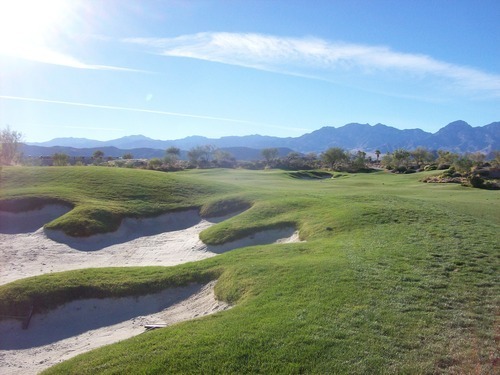 It’s an interesting concept, but I had only previously played two of the courses represented in this layout: Old Works in Montana and PGA West Nicklaus Tournament Course in La Quinta. 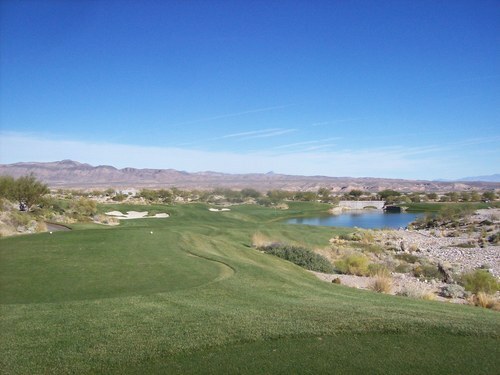 In fact, my friend and I just played the PGA West course a few weeks ago, so it was fresh in our minds and we were curious to see how it compared. The best direct comparison I had was on the par-3 4th hole at Bear’s Best, which is a replica of the 7th hole at Old Works. 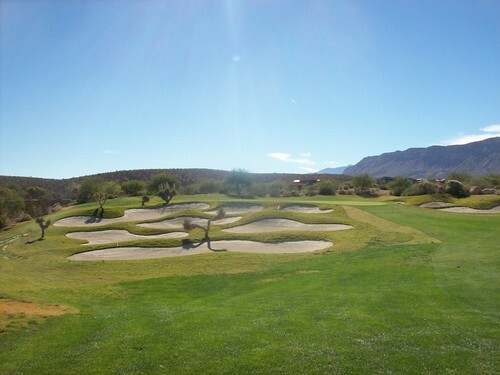 Old Works, as you may know, is known for its distinctive sand traps, which contain crushed black slag from the old mines where the course was built. They brought in some of that black sand especially for two holes at Bear’s Best that pay tribute to that unique course. 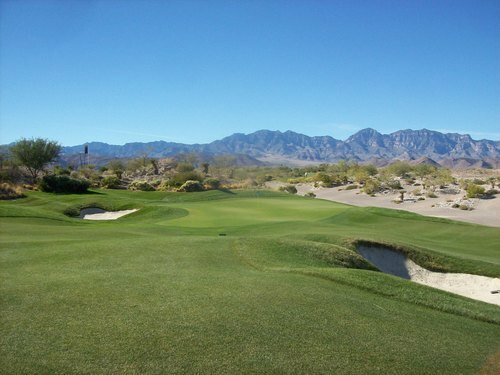 The 18th hole at Bear’s Best is a replica of the very distinctive (and tough) par-4 18th at PGA West Nicklaus Tournament Course. It looked a little different as the water was rather low in the pond and it doesn’t have the 9th green connected to it like the real one, but otherwise it seemed to play similarly. It was hard to tell with it being so dark and I don’t really have a good comparison for photos. 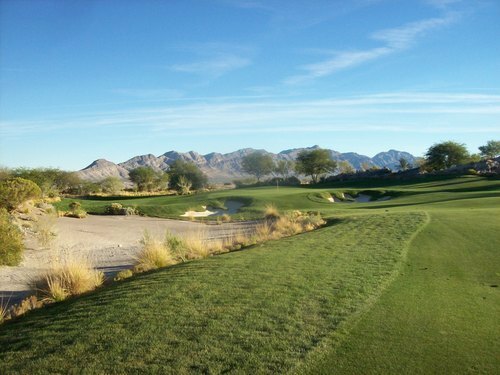 The rest of the course is made up from a variety of holes from other Nicklaus designs and they bring in some small aesthetic touches to enhance the experience. 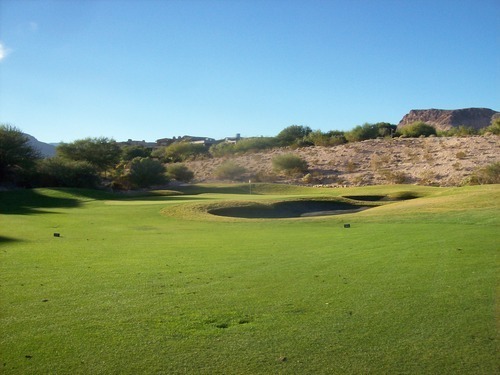 Some cacti were planted along some of the Mexico holes. 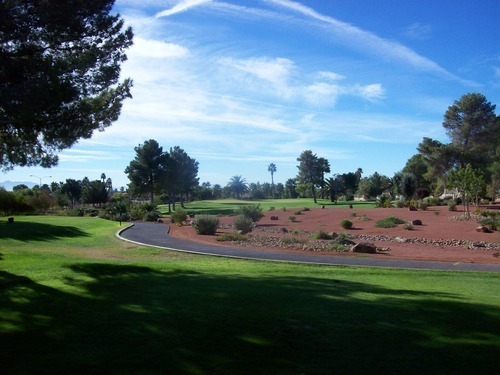 Red sand was used in the waste areas along the Arizona holes. 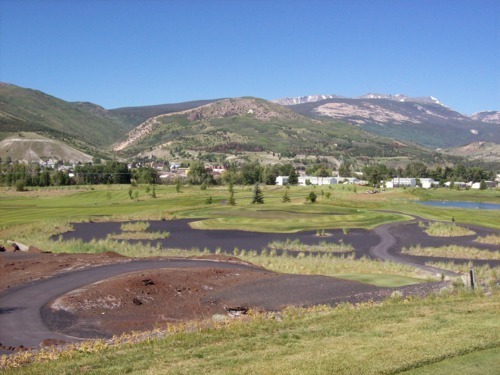 Probably the most distinctive is the hole from a Colorado course, where they planted some pine trees to provide more of a mountain style feel. As these trees continue to grow and mature I think it will only make this hole feel more appropriate. 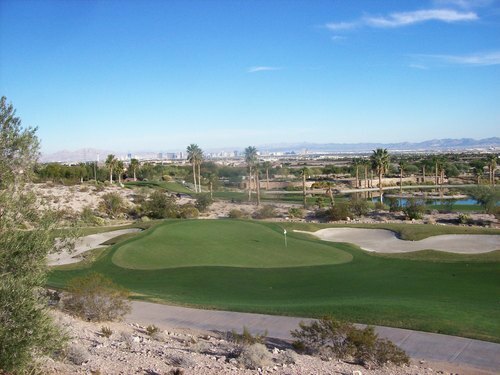 Still, throughout the layout you are reminded of where you are as there are some fantastic views of the Vegas Strip to one side and the desert mountains provide a stunning backdrop on the other side. Also, you have some really fancy homes along the course that all look like they are straight out of Architectural Digest. Even not being familiar with the real holes these are trying to replicate, it’s a very enjoyable experience at Bear’s Best. This is a good layout on its own. 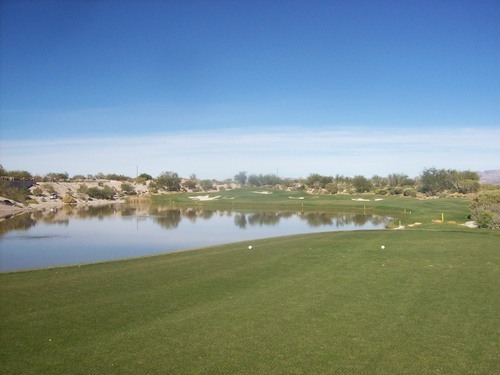 Being a compilation of signature Nicklaus holes, we assumed it was going to be a very difficult course. There are some really tough holes like the 1st and 18th and the greens are very well-protected like all Nicklaus courses, but mostly the layout is a more “fun” mix. There are some easy holes and others that offer risk/reward options. It’s still challenging, but quite fair. 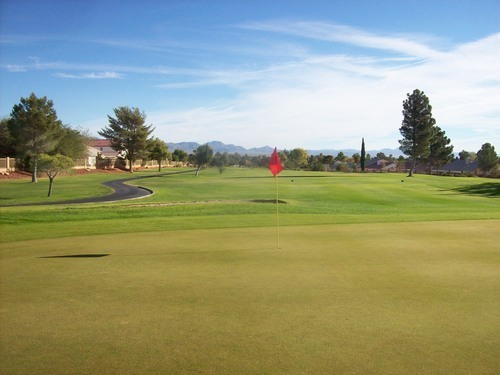 The course was in pretty good overall condition. 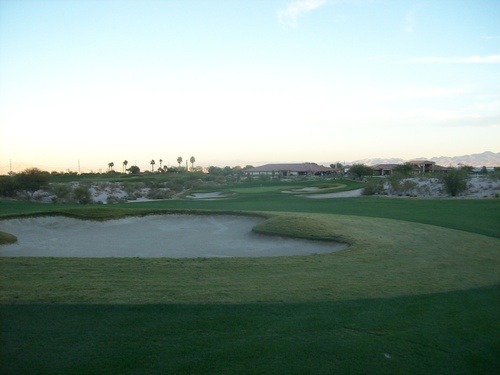 It’s been out of the overseed for awhile now, but still had the feel of a course that was fresh out of maintenance. The tee boxes were nice and lush, but too shaggy for my tastes (especially with the “sticky” rye grass). The front nine fairways were mostly good but not always consistent as the grass didn’t seem quite as mature. 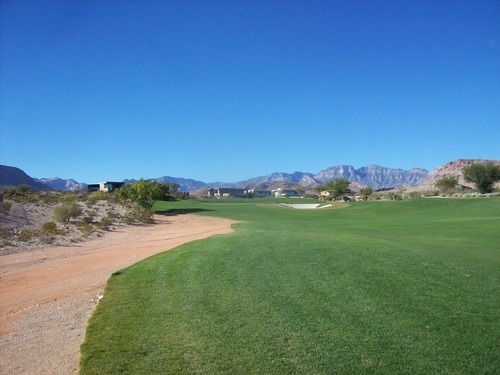 The back nine fairways were much nicer. 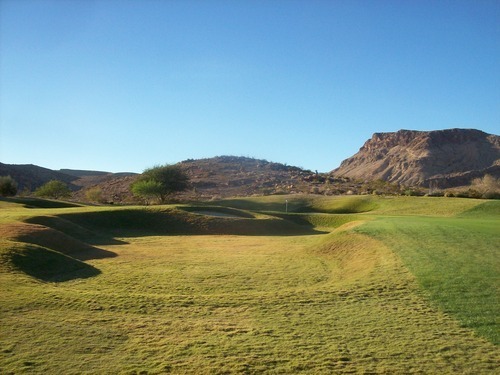 The rough was a mixed bag because of different design approaches used for the “tribute” holes throughout the course. In many places it’s a semi-dormant fluffy bermuda where the ball will either sit beautifully on top or settle down a bit and be tougher to hit clean. Other holes have more lush rye grass, but it wasn’t too deep or penal. I was in one bunker and it was good. One of the guys in our group found the black sand on both of the Old Works holes and said it was too firm. Having played the real stuff in Montana, how it’s playing at Bear’s Best right now apparently isn’t the best representation of it. The weak spot of the course was definitely the greens. They were not very good looking and were often bumpy. They weren’t horrible to putt on, but far from what you’d expect from a course of this caliber during this part of the season. Overall, I’d have no problem recommending Bear’s Best to anyone, whether you know any of the original holes or not. This is an enjoyable layout in a great setting, so it is good enough to stand on its own without the gimmick. That said, I do think it’s worth seeking out a deal. If we had paid anywhere near full price, it would have been harder to justify. 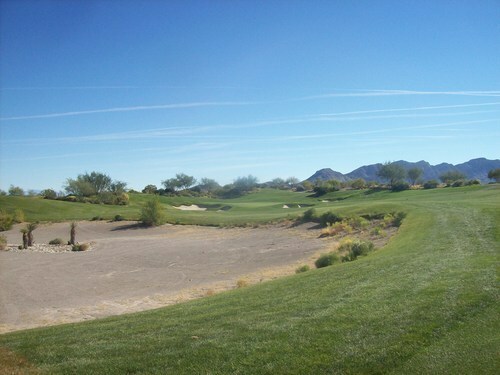 Short Course Blitz #5: Hi, Desert!